YAY! I finished sewing all the rows in the Jellyfish quilt this weekend! I was lucky to take the whole day on Saturday and sew. I spent most of the day with my quilty friends at the PMQG All-Day-Sew and was able to get a lot done, then I came home and finished up the last few (very small) rows. I’m starting with the top corner and will work my way down. When I stitched the rows together I used a ladder stitch, now to connect the rows, I use a whip stitch. This is the fun part! Each little stitch builds the quilt. I already have the small corner done and it’s sooo exciting! I started this project in January, and am really happy with the progress – I hope to have the quilt fully completed by the end of the year. Thanks to my new quilty friend, Sam, I was turned onto something called Thread Heaven. It’s a thread conditioner made of silicon… and it really helps keep the thread from knotting up. 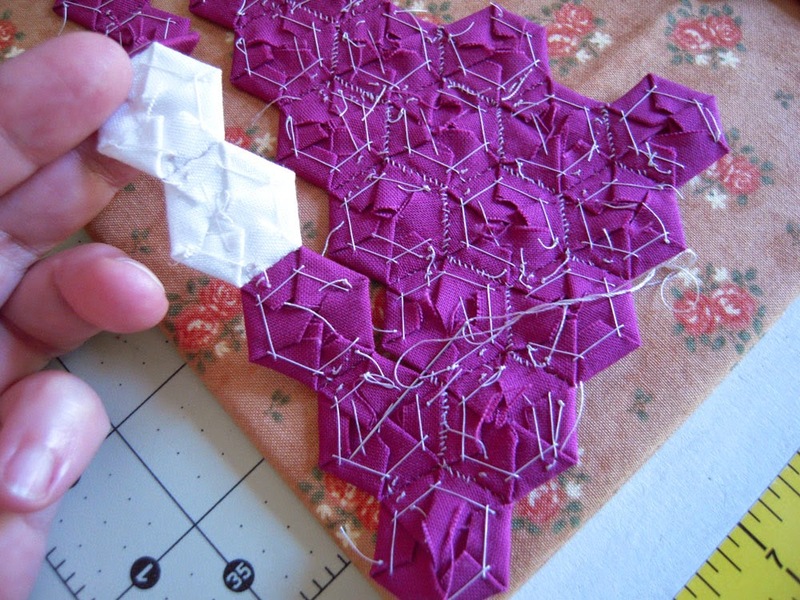 I think it’s helping me stitch a little faster too – I highly recommend it! 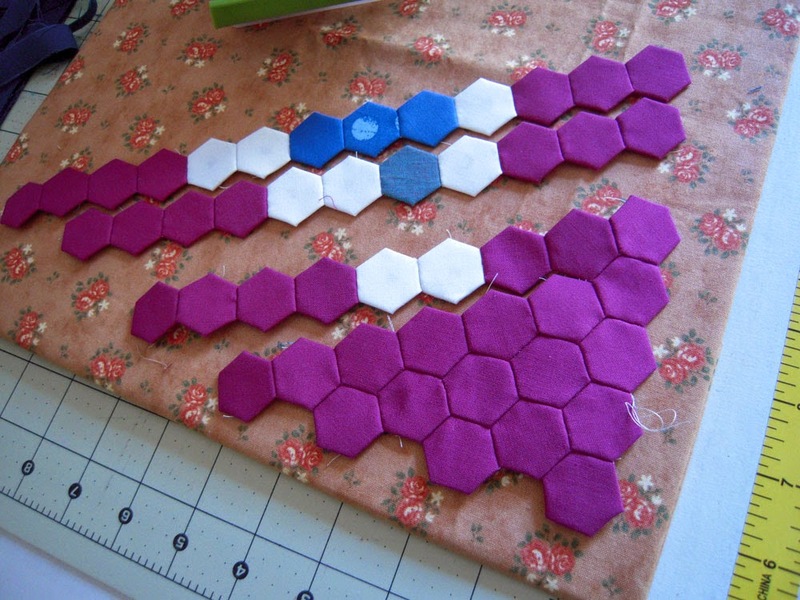 I’m hoping my progress with the hexies goes fast so I can dig into some new fabric and machine sew a few things. I’ve been big into dots… and I’ve always liked tone on tone prints. It’s hard to have these out and not be using them yet. 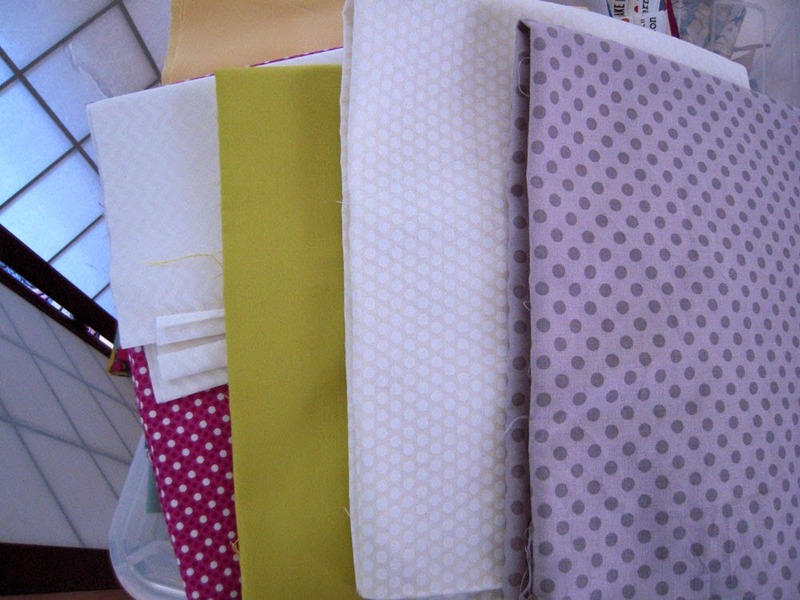 The cerise with white dots is for the back of the Jellyfish – I think it will be perfect. Now that I’m at this phase of the project, I can start considering the kind of quilting I want to do… French Knots will certainly make another appearance! I had no idea you were so close to having them all stripped together! It was so much fun sewing with you all day on Saturday. I can't wait to see your progress again soon! Yes – that was fun!! We'll have to do it again, maybe a smaller group even 😉 Thanks Kim!